modifications: used smaller needles. The smallest size on the pattern was a 33.5” bust and I am a 31” size bust size. Original needles called for 4.5 mm and 5.00 mm circulars – I used 3.75 mm and 3.50 mm to make the sweater smaller. Sometimes a knit you THINK you won't like can result in a big surprise when you finish it. Mr. Greenjeans was my second sweater project since learning how to knit 'properly'. I decided to knit Mr. Greenjeans for a few reasons: it was a cardigan comprising baby cables knit without a cable needle, a button hole, and ribbing along the front and the neckline. It was knit completely in the round, which I love because there are no seams to sew up. As added incentive, Mr. Greenjeans was designed for Knitty by the owner of my local LYS, Amy. The further I got into the project, the more I was certain I would not like the finished product. 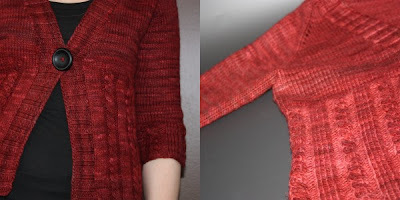 I found the cables fussy - they added a bulk to the sweater I did not like. I am a small person and bulk is not flattering on me. I surmised I would never wear the sweater and and it took longer to finish the project than I would have liked. However, I started it so I had to finish it! 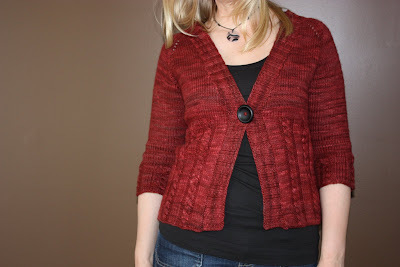 I completed the knit, blocked it and tried it on.....the cardi is AMAZING, the fit is perfect - this is a knit I can absolutely see myself wearing. I do need to find a better button - my temporary button is too heavy. The malabrigo blocked out to a soft, wonderful yarn and the cables flattened right out adding a flattering fit around the waist. As you can tell by this post, I am excited.